WAYLAND BAPTIST UNIVERSITY was established in 1908 by pioneer physician Dr. James Henry Wayland, who believed that education should be accessible to all and that it should be grounded in faith in Christ. Wayland is the oldest institution of higher education in continuous existence on the High Plains of Texas. Wayland Baptist University exists to educate students in an academically challenging, learning-focused and distinctively Christian environment for professional success and service to God and humankind. 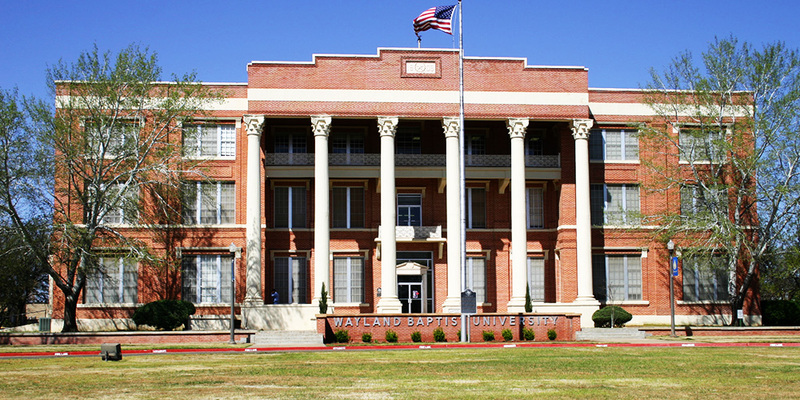 Wayland’s home campus in Plainview, Texas, a city of about 23,000, is located on the High Plains of West Texas between Lubbock and Amarillo. Wayland also operates campuses in Lubbock, Amarillo, Wichita Falls and San Antonio, Texas; Altus, Okla.; Clovis and Albuquerque, N.M.; Phoenix and Sierra Vista, Ariz.; Anchorage and Fairbanks, Alaska; and Mililani, Hawaii. The university also offers a full degree program in Kenya, Africa, and extensive programs online. WAYLAND provides a wide variety of degrees and programs of study to fit your academic interests. Classes are small and highly personalized, averaging 16 students. They are led by expert, mentoring faculty, not teaching assistants. Students in Plainview can participate in a number of student government organizations, honor societies, academic clubs, special interest and Christian service organizations, music and drama groups, and social fraternities and sororities.